FROM THE CEO/CIO As bcIMC invests patient capital on behalf of our clients for the long term, managing risk is as important as generating returns. Our business involves taking on risk and pricing it accordingly while having the ability to avoid or minimize risks that are costly and affect returns. Unwanted risk will potentially increase costs and reduce cash flows. Our long-term view enables companies to align their interests and refocus their activities away from the short term. This allows them to establish better governance and management practices, including occupational health & safety matters. Lost production due to disabled workers costs companies more than $42 billion annually, according to Health Canada. 1 Compensation paid to injured workers in 2012 amounted to nearly U.S.$1 billion per week, reports the Occupational Safety and Health Administration. 2 Certain sectors – such as agriculture, mining, construction, oil & gas, forestry, manufacturing, and transportation – have greater risk than others. Globalization drives changes to businesses and technology. It adds to operational complexity and exposes companies to new safety cultures, different standards, and new risks. New technologies add further complexity. 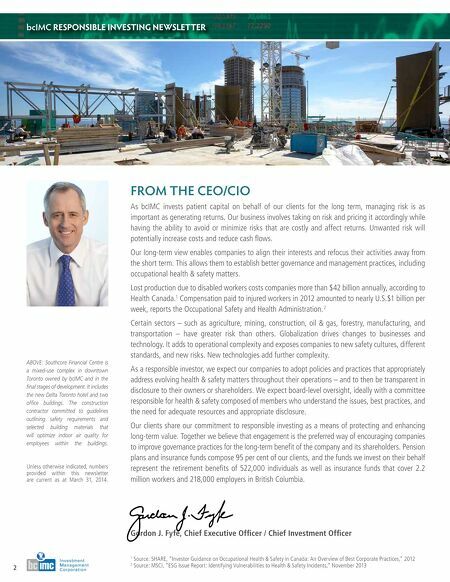 As a responsible investor, we expect our companies to adopt policies and practices that appropriately address evolving health & safety matters throughout their operations – and to then be transparent in disclosure to their owners or shareholders. We expect board-level oversight, ideally with a committee responsible for health & safety composed of members who understand the issues, best practices, and the need for adequate resources and appropriate disclosure. Our clients share our commitment to responsible investing as a means of protecting and enhancing long-term value. Together we believe that engagement is the preferred way of encouraging companies to improve governance practices for the long-term benefit of the company and its shareholders. Pension plans and insurance funds compose 95 per cent of our clients, and the funds we invest on their behalf represent the retirement benefits of 522,000 individuals as well as insurance funds that cover 2.2 million workers and 218,000 employers in British Columbia. Gordon J. Fyfe, Chief Executive Officer / Chief Investment Officer 1 Source: SHARE, "Investor Guidance on Occupational Health & Safety in Canada: An Overview of Best Corporate Practices," 2012 2 Source: MSCI, "ESG Issue Report: Identifying Vulnerabilities to Health & Safety Incidents," November 2013 Unless otherwise indicated, numbers provided within this newsletter are current as at March 31, 2014. bcIMC RESPONSIBLE INVESTING NEWSLETTER 2 ABOVE: Southcore Financial Centre is a mixed-use complex in downtown Toronto owned by bcIMC and in the final stages of development. 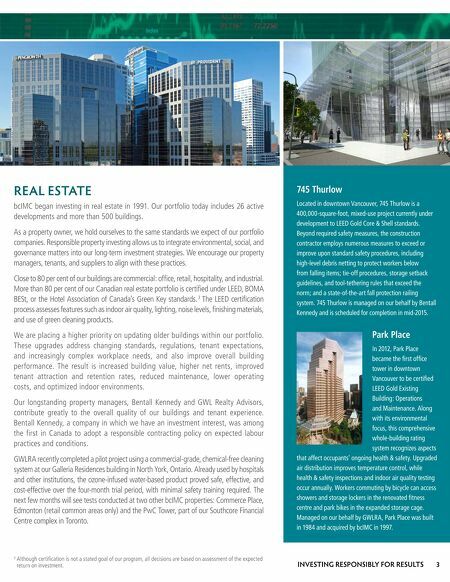 It includes the new Delta Toronto hotel and two office buildings. The construction contractor committed to guidelines outlining safety requirements and selected building materials that will optimize indoor air quality for employees within the buildings.